Today I finally finshed my OH My Stars! Quilt, which I started last April (that's April 2013) I may have blogged about the quilt before: here, here, here, or here. So, it clearly counted as a long term project. The part that took the longest was the actually quilting by hand. I started in September and made reasonable good progress, but then other stuff got in the way. I pulled it out again around Christmas time, but didn't finish it then. Last Thursday was a holiday, so I decided to tackle it again and do the last ten stars that were left. 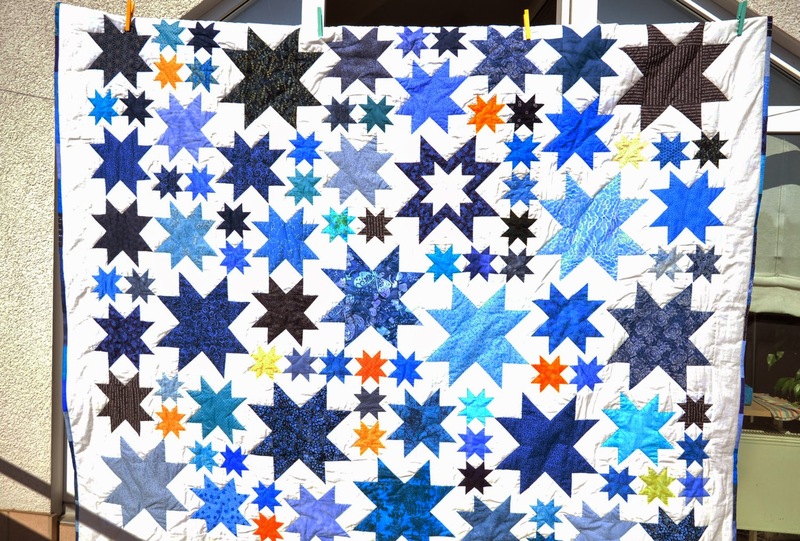 I added the binding I already had prepared using all the blues I used for the stars, and this morning I finally, FINALLY, finished the quilt. 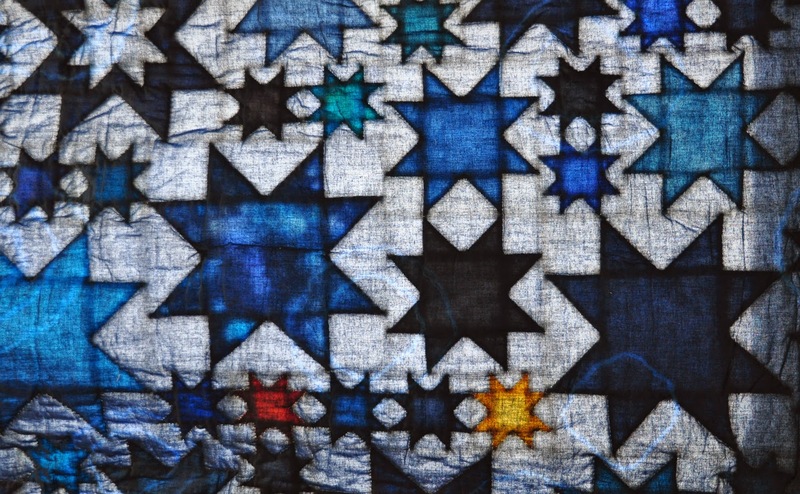 One thing I totally love about the quilt is when I started making the photos, I noticed how the sun was shining through the quilt. This photo is from the back, which is mostly medium dark blue. Today's offering are two smallish projects I've finished this week. 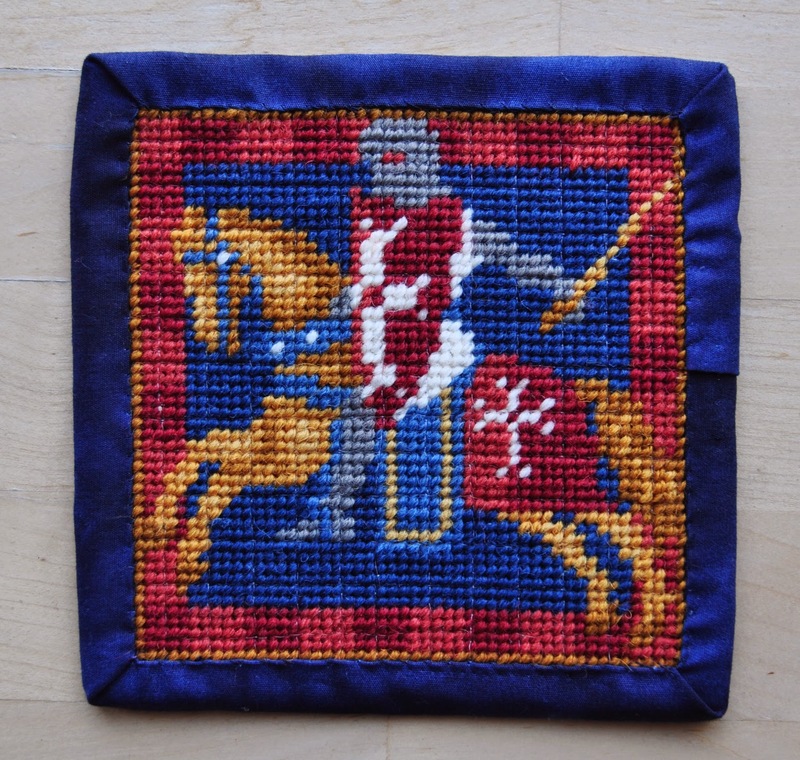 First is a needlepoint Knight which I turned (oh the shame) into a coaster. This was a kit from Millennia Designs, which I bought at Liberty in London. It stitched up very quickly and was a nice little, in-between stitch. In the end I almost ran out of the darker blue used for the background and had to do some fudging in the stitching to make it work. One extra strand would have helped a lot here. 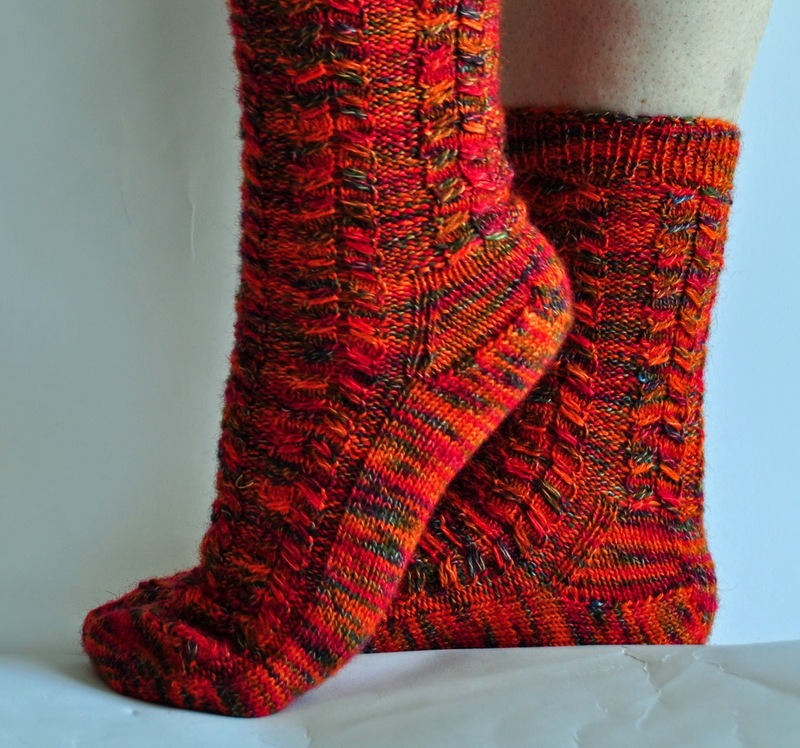 The pattern works well with the yarn (Zitron Trekking Hand Art in the color 'Sumatra'). I really liked how the tow up construction came out. Somthing I have to remember for the next time I do a toe-up. 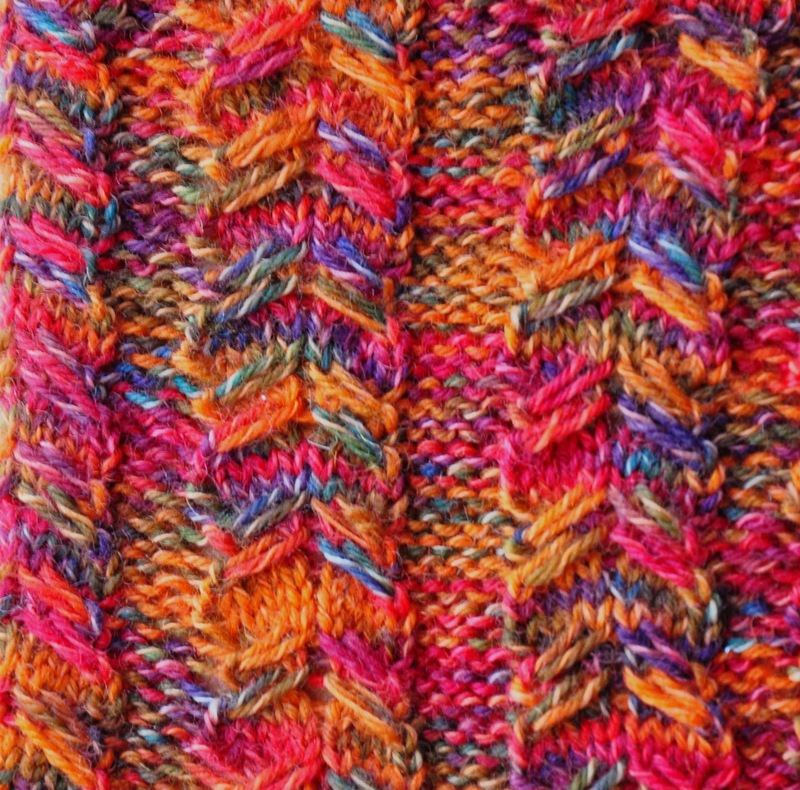 Though I like how the pattern looks, I didn't exactly enjoy knitting it, as I was rather fiddly to do. I saw that pattern in another blog a long while ago and it wouldn't let me go. It can be found at Bee's Needleworks. I finally went, bought the pattern and started stitching almost immediately. I went with different veriagated and solid greens for the different stitches. It has been super fun to make and try out the different stitches. 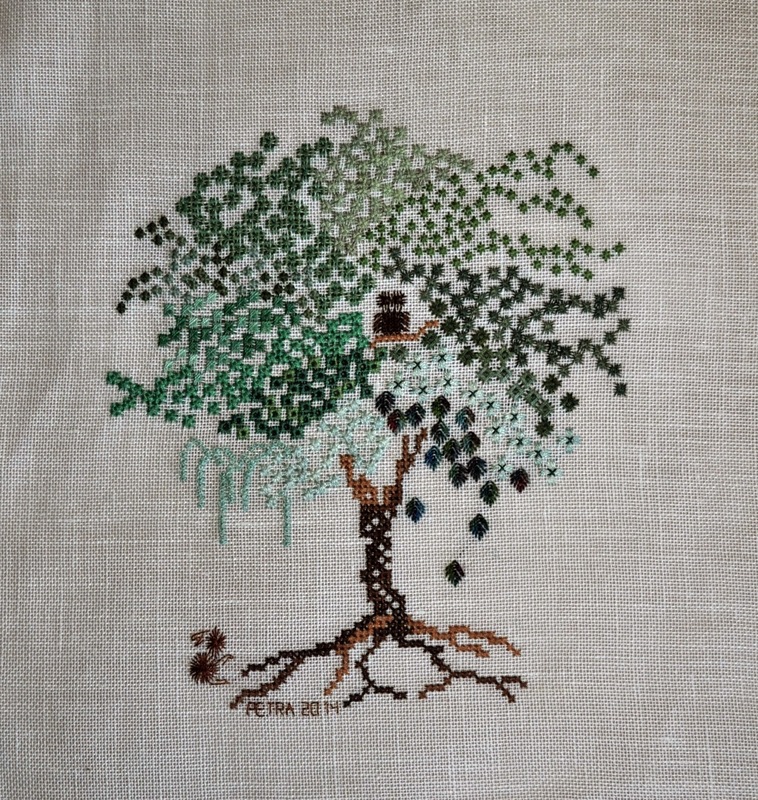 The original also offers the option to add beads, but I decided against it. The patterns is improvised (I should have used a bit more contrast, I'm thinking now). 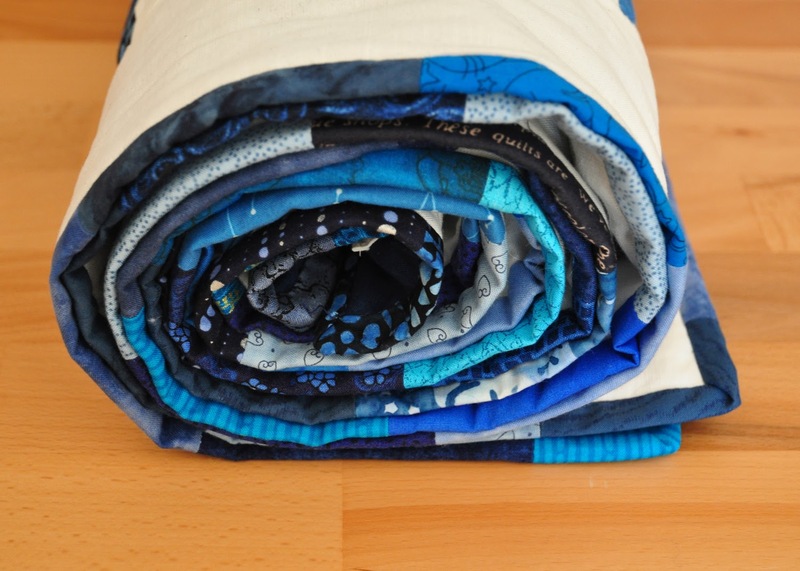 The quilting I did using my walking foot, which worked surprisingly well. I also started another large scale quilt, using up some of those 5 x 5 inch large charm pack left overs and scraps I've got lying around, plus some of 2 x 2 inch bits I have collected the last two years or so. 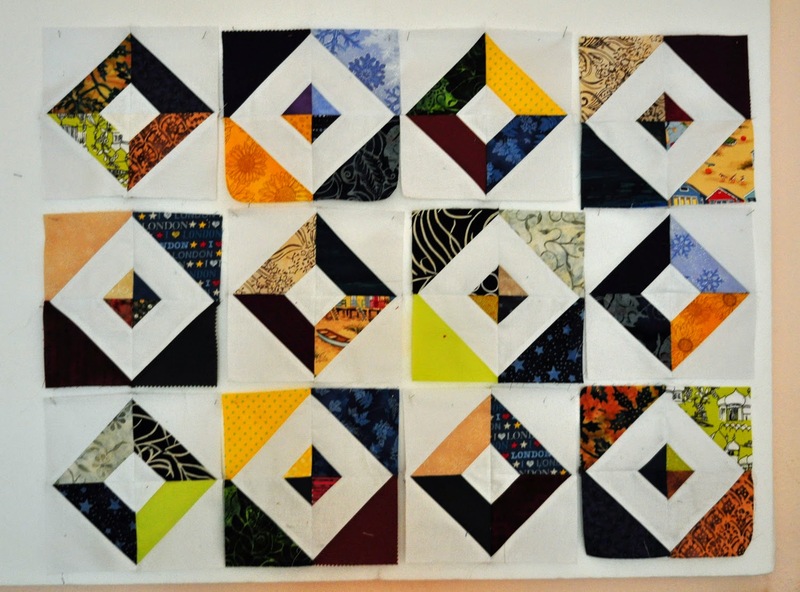 The current aim is to make the quilt center 6 x 7 diamonds, plus a white frame, plus a colorful border. Of the 42 patches I need I have made 28 already. Some wild combinations, but so far I like it.